Whatsapp Messages: Admissible in Court? Whatsapp is a text messaging application that is used by more than 1 billion users in more than 180 countries. Its use has become so prevalent that it has become a primary mode of communication for many individuals. Many parties now use Whatsapp even for business purposes, such as communicating with clients, sending documents or even negotiating contracts. As lawyers, one of the questions we get asked frequently is whether Whatsapp messages can be adduced as evidence in court. Some clients operate under the impression that because of its “informal” nature, Whatsapp messages would not be admissible as evidence. However, this assumption is inaccurate since there have been many instances where the Malaysian Courts have allowed Whatsapp messages to be adduced as evidence. In the case of Mok Yii Chek v Sovo Sdn Bhd & Ors  MLRHU 196, the High Court held that print-outs of e-mails and Whatsapp messages fall within the wide meaning of “document” under the Evidence Act. As such, those print-outs can be treated as any other printed document when it comes to admissibility. The party who adduces the Whatsapp message must meet the procedural requirements of admitting a document produced by a computer (eg: through oral evidence that the print out was produced by the computer in the course of the ordinary use of the computer, or by providing a certificate under Section 90A of the Evidence Act 1950). 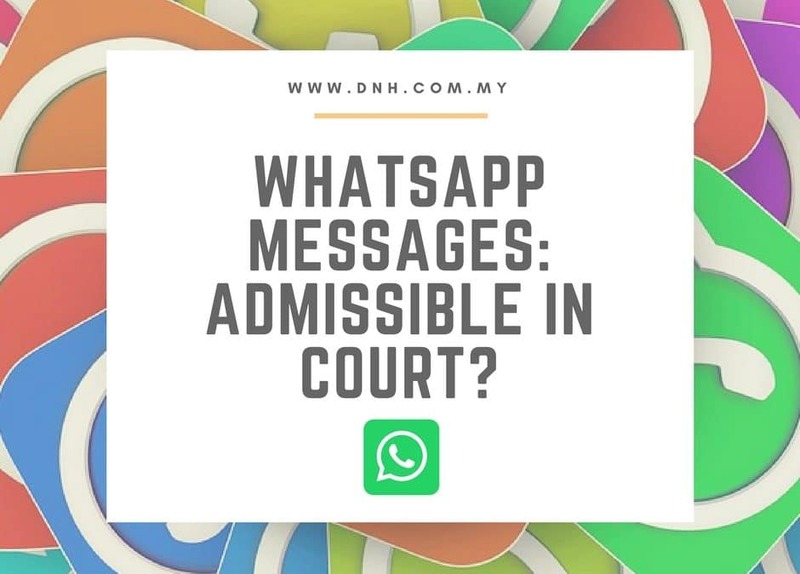 In this case, the High Court not only found the Whatsapp messages to be admissible, but added that they should be given “great weight” because of the contemporaneous nature of the Whatsapp messages with the key events in that case. The High Court also found that the Whatsapp messages can be used to corroborate the oral testimonies of the witnesses, giving them more credibility. Have there been situations where Whatsapp messages were not admissible? Further, through a demonstration in Court, the Claimant was able to show the Court that a Whatsapp message can be fabricated, resulting in a fabricated Whatsapp snapshot image of that message. 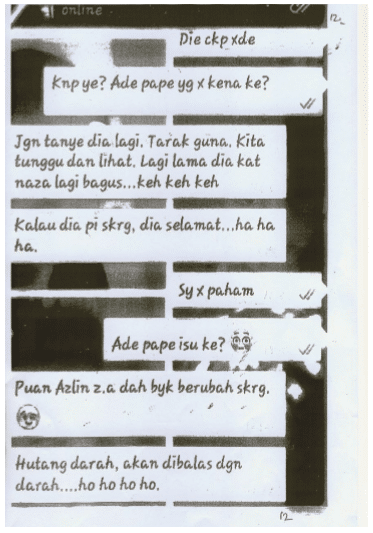 In another recent case, Nazaruddin Mohd Shariff @ Masari & Ors v Samsyem Saam & Ors  1 MLRH 594, the High Court found it was “wholly unsafe at this stage of the proceedings to rely on Whatsapp messages as conclusive evidence”. Here, the Defendants attempted to rely on some Whatsapp messages with the Plaintiffs to prove that the Plaintiffs had allegedly admitted that they were not the rightful beneficiaries of the estate. The High Court concluded that this issue could easily be proven by adducing the “Sijil Faraid”, a formal document which would have conclusively shown the rightful beneficiaries of the estate, which the Defendants failed to do. As such, the High Court refused to admit the Whatsapp messages as evidence. they don’t wholly rely on Whatsapp messages to build their case, especially when there are other documents available that would be able to conclusively prove the facts in issue. This article was written by Donovan Cheah. He has been named as a recommended lawyer for labour and employment by the Legal 500 Asia Pacific 2017. He has written for publications such as the The Edge and the Star, as well as for the Malaysian-German Chamber of Commerce and Industry. Have a question? Please contact us.